Today I had my fourth visit from a crisis team member. This time I was barely engaging in conversation. I just didn’t see the point of anything, I thought I was just a waste of time and energy. I spat out my flouxetine tablets when my mum wasn’t looking but I did confess that later with the assessor. The other night I had grabbed a knife and started stabbing boxes and things while laughing but there was no joy in that laughter I think it’s what you would call hysteria. Noticing my failure to engage in conversation and my lack of, well, anything a human should feel. My mum and assessor agreed that i should spend the night in a hospital. They are especially worried because of Void he has been getting stronger and more out of control lately in fact he’s almost controlling me. Getting a bed in the psychiatric ward is easier said than done. I have been waiting for four hours now. 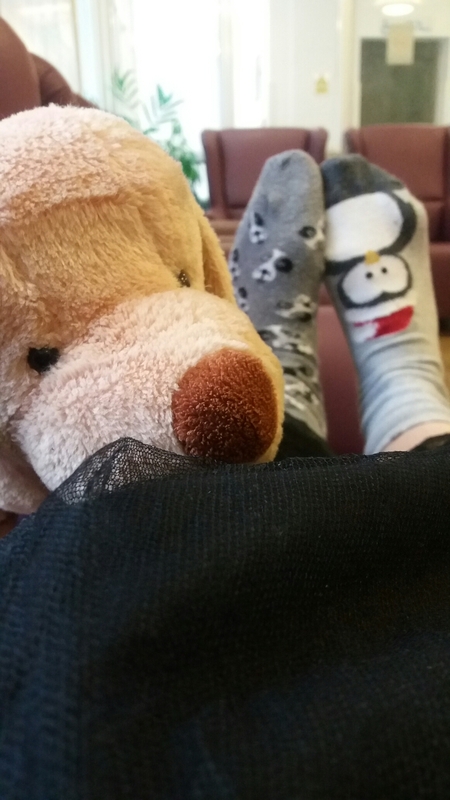 I do feel safe here in the waiting room though there’s nothing visible that i can use to hurt myself and i found a doggie in the toy box for me to cuddle.